Though less powerful and protective than the war’s other vehicles, motorbikes were widely fielded in the Second World War. They were useful for messengers and reconnaissance troops, especially in fast-moving formations. Many of the nations involved in the war produced their own versions. 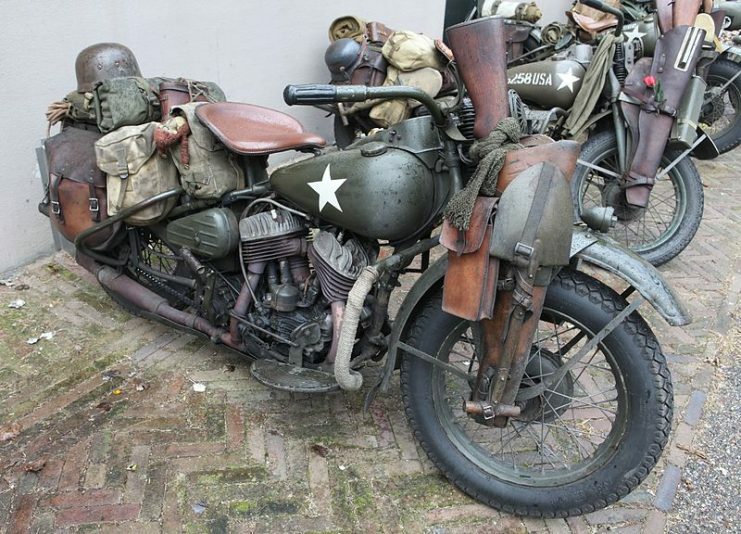 Many of the motorbikes used in the war were civilian models that had been adopted and repainted by the military. 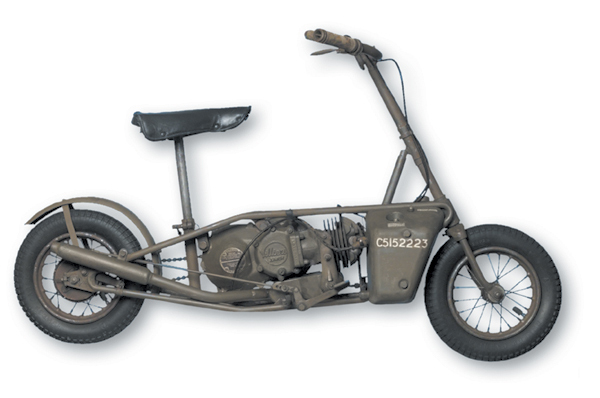 The Austrian Puch 800 was one example of this approach, with many units bought by the army straight from the factory. Its most unusual feature was a shallow vee engine which was set across the frame of the bike. It was usually equipped with a sidecar. The FN Company in Liège had been selling civilian motorbikes to the Belgian Army since World War I. After providing M86 bikes in 1936, it decided to go one better and develop a model specifically for military use. The M12 was significantly better than the M86. Attached to the side was a boxy sidecar with machine-gun mountings at both front and back. A more powerful engine drove both the rear wheel and the wheel of the sidecar. It could maneuver well in small spaces thanks to a reverse gear. 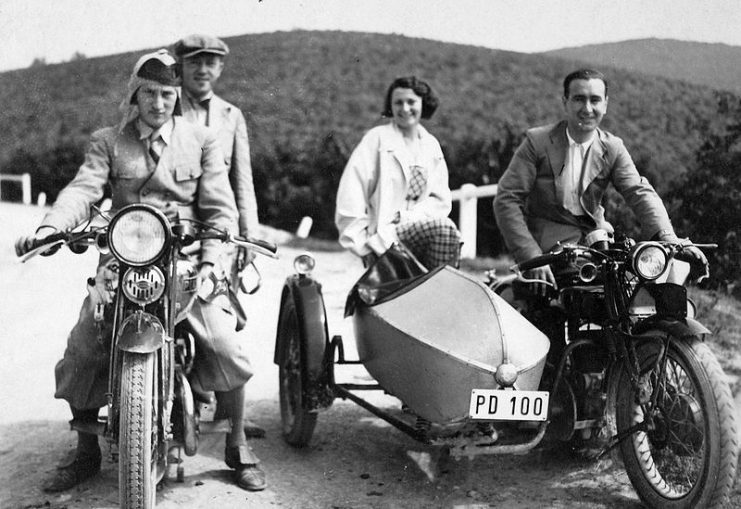 One of several similar bikes created for the Czechoslovakian army in the 1930s, the single-seater CZ 175 wasn’t a powerful bike. Built as a light bike, it could be manhandled with ease to get over rough terrain but had only limited power. Only the front wheel had any suspension. Built in 1938 for the French Army, the Armée was a tougher, heavier version of prevalent civilian designs. It was usually equipped with a sidecar and was most often used for communications, carrying a passenger around. Its flat-twin 750cc engine drove the rear wheel but not the sidecar one. An improved version, the AX2, was given an 804cc engine which provided superior traction, letting it travel better over bad terrain. 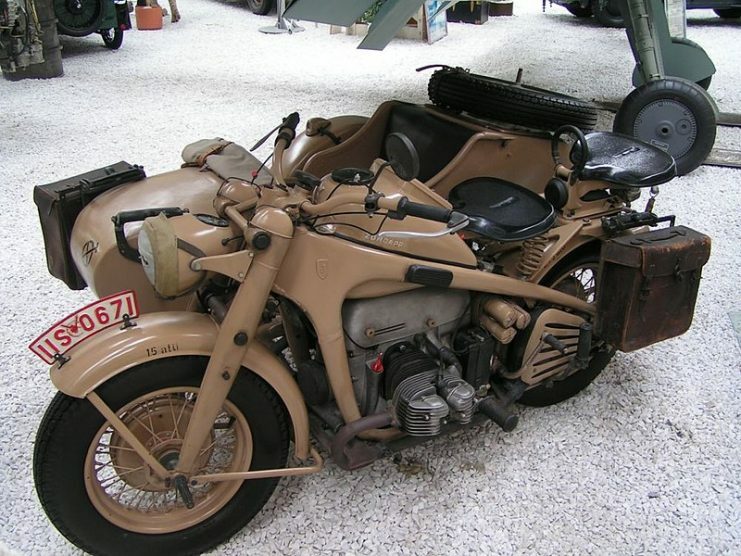 A large, heavy bike, the R75 was one of several German models built specifically for operation with a sidecar. The sidecar had racks to carry either a mortar or a machine gun, turning the whole vehicle into a mobile weapons platform. 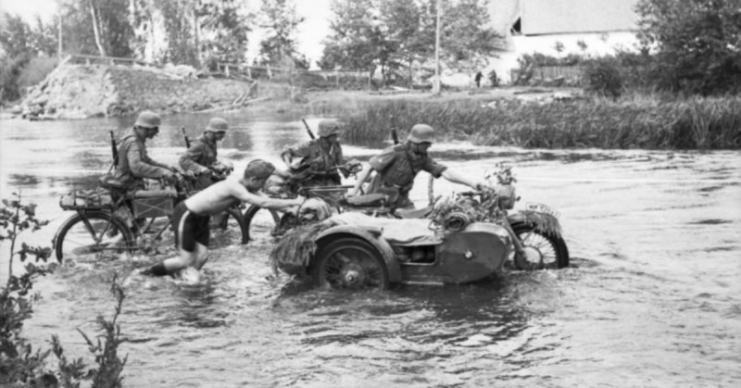 These vehicles were primarily used in Kradschützen units – mobile motorbike forces within Panzer divisions. They were also sometimes used by paratroopers, who carried them in the holds of Junkers 52 transports. The Zundapp company’s answer to the R75, the KS750 was another German heavy military motorbike. 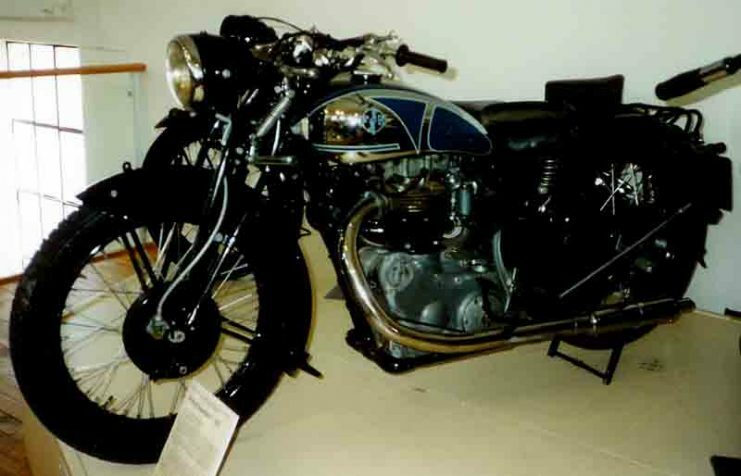 With a similar layout and size of engine to the R75, as well as a standardized sidecar, there was little to differentiate the KS750 from the BMW model. It served in the same roles, again carrying either a mortar or a machine gun mounted on the sidecar. 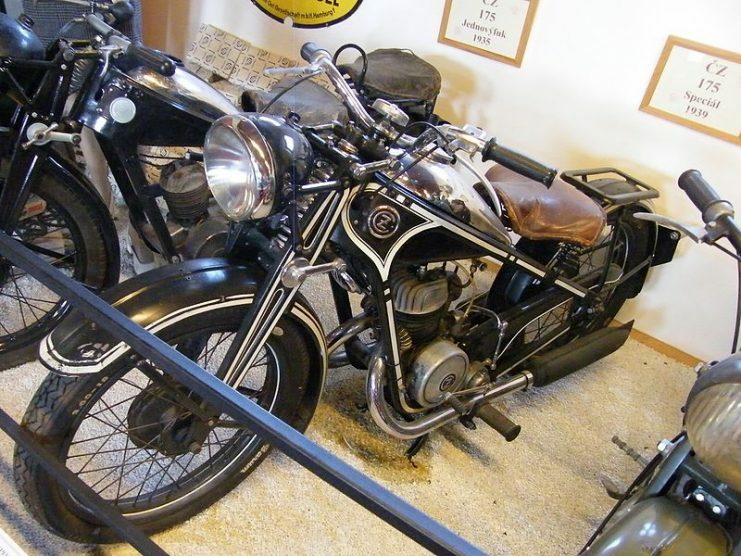 Built in 1937, the Type 97 was a Japanese imitation of American Harley-Davidsons. It was primarily used on the Japanese home islands but sometimes taken overseas as Japanese forces spread across East Asia. The Type 97 was sometimes fielded as a solo bike, sometimes with a light sidecar. 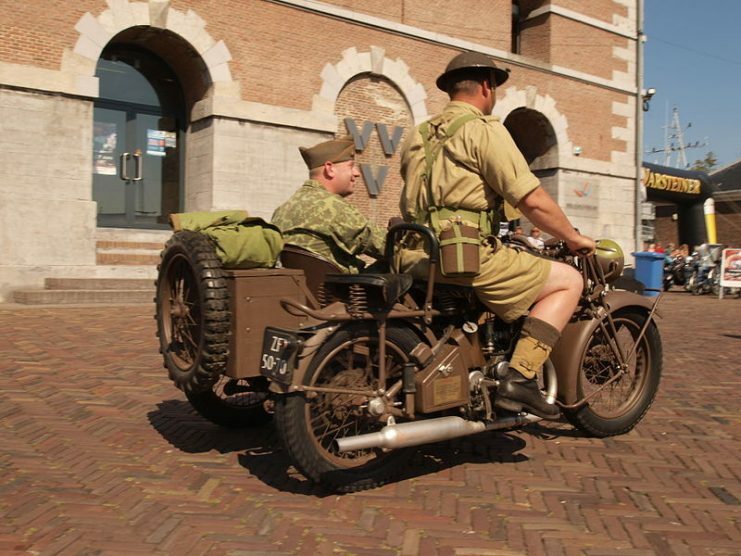 It didn’t usually carry weapons, though a machine gun was occasionally mounted on the sidecar. The Welbike was an unusual British design. Meant to make airborne troops more mobile, it was small enough to be packed up in a container and dropped by parachute. The result was an awkward looking bike with tiny wheels and an underpowered engine with only 98cc of power. The saddle and pillar folded away for transport. The Welbike could carry no equipment, was almost useless off-road, and was unsuitable for tall riders. It was quickly abandoned by the military but revived after the war as a relatively cheap and portable civilian vehicle. Another British bike, the 16H’s ruggedness and dependability made it popular despite its modest performance. 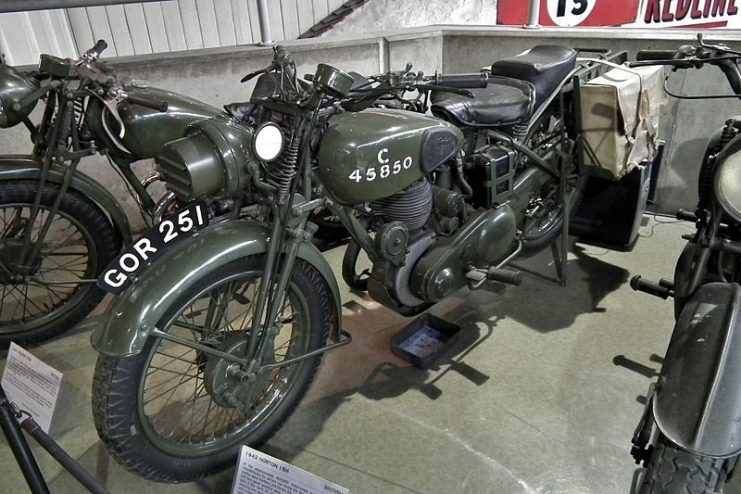 The British Army mostly used it as a solo vehicle during convoy marshalling and to dispatch riders. The Royal Air Force equipped it with a sidecar as standard. The Canadian Army, like its British counterpart, used the 16H for dispatch work. The Norton 633 was a more powerful version of the 16H. 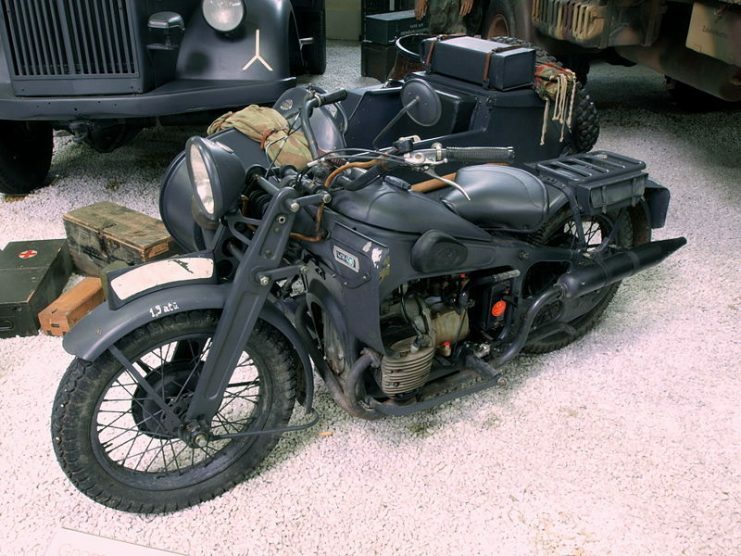 Designed to be fitted with a sidecar, it was the only British military bike to provide drive to the sidecar wheel. This sidecar wasn’t like civilian ones, being little more than an open box, devoid of protection from the weather. It had a rack for a Bren light machine gun and was sometimes used as a weapons platform. 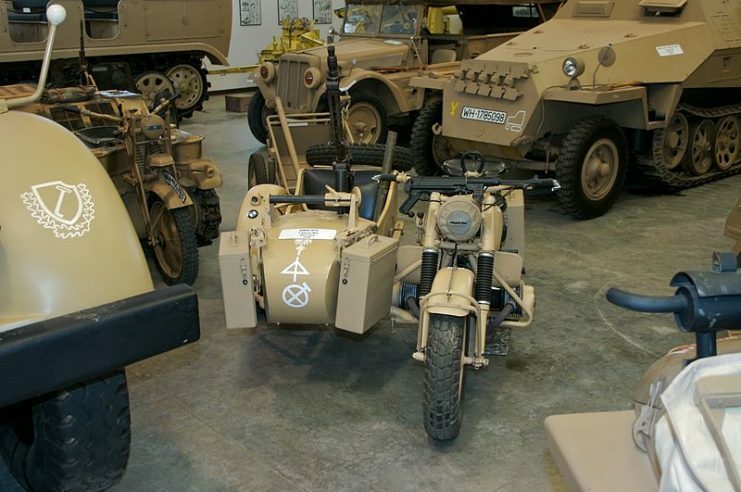 Cushman scooters were adopted early in the war for messengers and employees at large U.S. military bases. Because of their usefulness, a new version was made in 1944 for use by airborne troops. Like the Excelsior Welbike, the Cushman Airborne could be parachuted into action and assembled on the ground to make paratroopers more mobile. It had limited fixtures – including no lights – but was more effective than the Welbike. 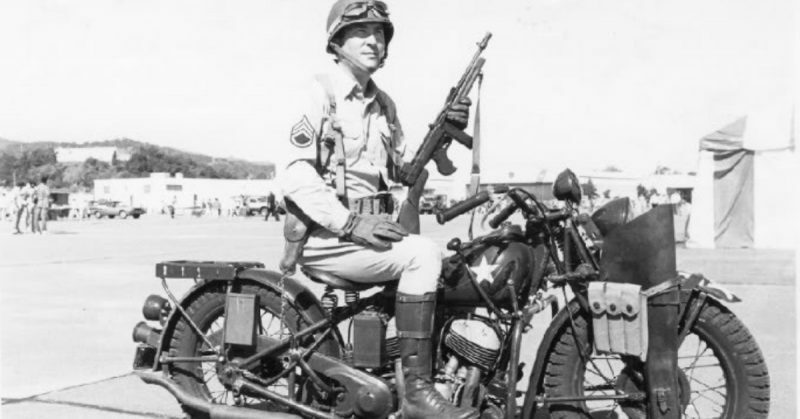 A slight modification of an existing civilian vehicle, the Harley-Davidson WLA was a popular bike among the American armed forces, who used it for police work, reconnaissance, and communications. Its lights were changed from the civilian model to meet military standards and it was fitted with special brackets to carry a submachine gun. 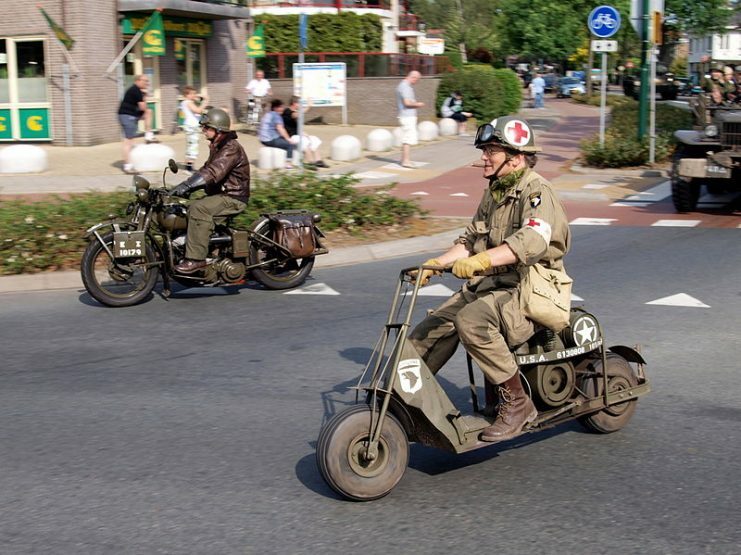 With a speed of 65mph, it was one of the faster bikes of the war. Weighing less than half of a Harley-Davidson WLA, the American M1 was originally designed for airborne troops. To this end, its components were built to withstand being dropped – if need be, the ignition could even work without the battery. Rugged, reliable, and great for cross-country travel, it was later adopted by other service branches for messenger work.